Just because you are a trader, it doesn’t mean you constantly need to check how the market is progressing. Sure, it’s important to keep yourself posted but you deserve some entertainment too. Why not do live trading and learn some lessons from the experience of other traders? Through watching trading movies! There are tons of them out there with very interesting plots. Not to forget, all of them are educational. It’s one of the best Wall Street documentary movies ever made and it’s based on a true story. The movie sets in the era of the global financial meltdown that occurred in 2008. Millions of people lost their homes and jobs due to the economic recession in the United States. The gripping narration by Matt Damon will keep you captivated. The movie explains how bankers caused such an extensive financial crisis. Extensive research and interviews with leading politicians, financial insiders and journalists unveil what led to the crisis eventually. You will also learn about the connection between the corporate world and politics. It’s another movie that’s based on a true story. It’s well directed and entertaining, of course. The movie is great since Leonardo DiCaprio played the character of Jordan Belfort charismatically. However, if you read the book, it will provide you more insight into the drug-related challenges faced by Belfort during the rise and fall of his career. Belfort takes an entry-level job at a brokerage firm. While in his 20s, he starts his own firm called “Stratton Oakmont.” Together with his partner and some brokers, he manages to make a fortune but by deceiving some wealthy investors. The FBI and SEC manage to close his empire and he is sentenced for 22 months in prison. He doesn’t just lose his empire but his marriage is destroyed too. It wasn’t easy for a man with an unprecedented appetite for excess to hold on to his kids and wife. After serving prison time, he manages to gain sobriety and turn around his career. The Famous book “Rogue Trader” written by Nick Lesson This film is apart from that book. Leeson is a trader working at Barings, a well-known investment bank. He is sent to Singapore to represent the branch of the bank there. Leeson makes risky trades with the intention to take advantage of the thriving Asian market. Before he knows it, he is struggling to hide the mess he created. He even flees the country with his wife. Eventually, he has to face the consequences of his actions. The movie is a perfect deception of the fact that even the top banks have little governance and risk management policies in place. It also takes you into the mind of a trader and explains the importance of having control over one’s emotions. 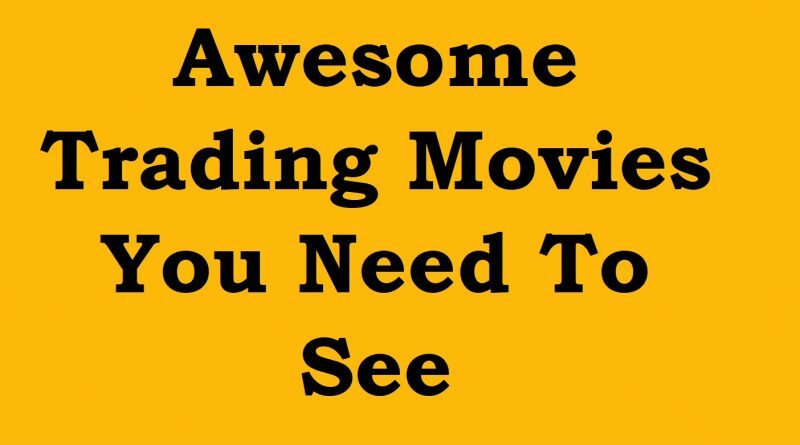 And that makes it one of the must-see movies for a trader. Michael Burry, a Wall Street guru realizes that some subprime home loans are about to default. Burry along with some other men bets against these houses and throws more than $1 billion into the credit default swaps. His actions attract a number of greedy investors. These men end up making a fortune by taking advantage of the impending economic collapse in the United States. The movie brings life to the failure of investment banks and the imaginary products bankers create for making a profit. It concludes that the greed of Wall Street was responsible for sinking the global economy in 2008. If you want to know what happens when you go over leverage, this movie will walk you through it. Margin Call is about an analyst who uncovers information that can ruin all the key players of an investment firm. The movie exposes how delicate the financial system actually is. It also exposes the greed and lack of morals of the financial players involved. These individuals were holding a bunch of toxic assets. Despite the fact that the disposal of these assets would bankrupt the purchasers, they still go ahead with it and end up undermining their credibility for forever. It will make you wonder how many enterprises are out there managing portfolios that are not even worth a jot. In case you haven’t seen this movie, it’s highly recommended to watch. What Can You Learn From These Movies? Whether you are a beginner or an experienced trader, there is so much you can take away by watching these trading movies. The lessons you learn can improve your day to day trading strategies and even mindset. One thing all these movies have in common is that greed is never a good thing. It can destroy you as well as others. It’s easy to get carried away once you see an opportunity to get rich. But don’t forget that history speaks for itself, when you try to outrun the market, the market end ups outrunning you. It gets you eventually even if you are using the best CFD trading platforms and you have an exit strategy in place.